Over this past summer, I’ve made this cake more times than I can remember. The cake pictured above was one of many of the Lemon Lavender Polenta Cakes I made this year, this one was crowned with beautiful fresh strawberries. However, I most often leave the cake as is, adorned only with a lemony glaze. There are so many elements about this cake that I love — it’s lemony, gluten-free, has just the right amount of lavender in it, and it’s made with olive oil, instead of butter! You’ll need an electric mixer for this cake (an electric hand mixer works) to ensure that you beat the eggs and sugar until they become thick and pale yellow, which is about two minutes. Once the beaters lift from the bowl, the thickened mixer should fall onto itself like a beautiful, pale-yellow ribbon. Most recently I prepared this as a gluten-free dessert alternative for a dinner that I was catering at IXDS. Lemon and lavender is a terrific combination, but too much lavender in anything can make it taste soapy. You needn’t worry, I think this has just the right amount. Grease an 8″ springform pan or line an 8″ cake pan with parchment. In a medium mixing bowl whisk together the almond meal, polenta, baking powder and sea salt until well combined and uniform in color. Set the bowl aside. Using a stand mixer or electric hand mixer in a separate bowl, beat the eggs and the sugar for 2 minutes until pale, golden and thick. Then, add the olive oil, lemon zest and lavender to the egg mixture and beat for about 10 seconds, until the zest and lavender are thoroughly mixed in. Then, add the dry ingredients into the wet and mix until just combined. Pour the batter into the prepared baking pan and bake in the center of the oven for 30 minutes or until the cake tester only had a few damp crumbs on it when pierced into the center of the cake. Remove from the oven and all it to cool before removing it from its tin. Once the cake has cooled, remove it from its pan and make the icing. To make the icing combine the sugar and lemon juice (starting with 2 tablespoons) and whisk until smooth. Drizzle the icing over the cake, while ushering the icing over the edges with a spoon if necessary. Garnish with lavender if you wish and serve at room temperature. 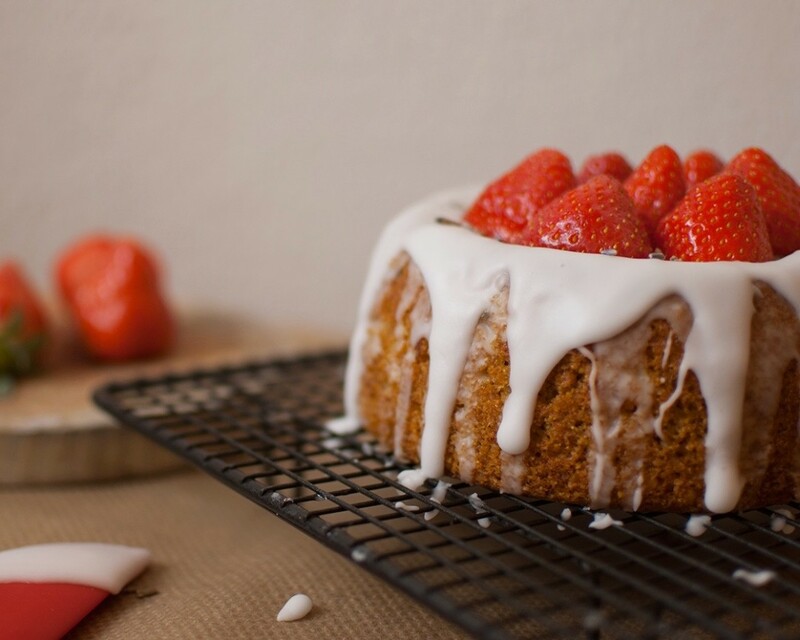 It’s best to wait for the cake to completely cool to room temperature before spreading the glaze.